This site has been inactive since I got on Facebook and will remain so. I'm keeping it up for the old travel reports, but I don't want to put in the effort to keep it spam-free, so I've just turned commenting off. If you want to contact me, there's an email link at the very bottom of the page (click on "Godsmurf"). Maybe some time in the distant future I'll make a site with just travel photos, that would be nice. I've been working on a new website for a while but this weekend I continued the Morocco travel report, which now has two new parts about the first days of our car trip in the south. There are mostly pictures of the great landscapes we drove through and of Aït Benhaddou, Morocco's famous kasbah. "In the middle of the Cold War, the United States played a role in the overthrow of a democratically-elected Iranian government". I never thought I'd live to see the day when an American president would admit to something like this (and there is plenty to choose from), but Obama said this in his speech to the muslim world today. Truly amazing, even though they're only words. Here is part 3 of the Morocco pictures about the empirial city of Meknes, the Roman ruins at Volubilis and the holy town of Moulay Idriss. We're back in Belgium since yesterday! It's been a great trip, one of my best trips in fact, but the last few days (after we returned the car) were a bit too much so we're glad to be back home. I promised to put up the pictures quickly this time and I deliver: here's part 1 of the travel report already with pictures of our first three days, spent in the northern towns of Tetouan (a world heritage site) and Chefchaouen (our favourite place in Morocco). There should be a new part every few days. Up next: Fez! We're four days into our car trip so far and it's been fantastic already, wonderful views along the way - especially the mountain passes - and beautiful kasbahs, especially Ait Ben-Haddou which was the highlight of the trip so far, just like I expected it would be. We first visited it in the evening but it was cloudy so I woke up at 5am next morning, saw that the sky was clear and went back again to make lots of beautiful pictures in the early sunlight. I did the same next day to climb the little mountain near Zagora, that way lazy Lotte can sleep late while I get some exercise. 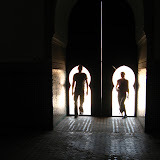 Two days ago we arrived in Merzouga on the edge of the Sahara near the Algerian border. We walked and climbed the lovely dunes there and last night did a camel trip including a night under the stars. Unfortunately it was cloudy and almost no stars to see, luckily I'd already tried out the star map my little sister gave me the night before and actually found Saturn and the constellation of Leo (my sign incidentally). I hope to get more stargazing occasions in the remaining days. We're now starting to head back west towards Marrakesh and plan to visit the Todra and Dades gorges along the way and hopefully visit a silver mine. Aaah, finally found a decent internet connection. Yesterday we arrived in Marrakesh and were very amazed to find a very modern, clean and seemingly prosperous city. This feels more like Barcelona than like what you'd expect here. Also, mostly modern looking people. You see more women with head-scarves in my area of Antwerp than here, for example. Very touristy feel to the place though, even though only a small percentage of the people walking around are actually tourists. On the train yesterday I made a great plan for a tour around the south of Morocco by rental car. We're leaving here friday morning and it will take about 7 days, filling most of the rest of our journey. It will take us over the highest pass in the Atlas, through the Draa valley, past all the major kasbah's and castles, into the Dades Gorge and over small roads in desert area right to the edge of the sahara for a desert excursion. So I'll probably be offline the whole week, dunno. Hello from Fez where we just arrived. I gotta keep it short and probably won't be updating a lot during this trip, BUT I'm gonna put up the pictures quickly afterwards as promised. We already visited the small cities of Tetouan and Chefchaouen (VERY nice place) and yesterday spent all day hiking in the Rif mountains near Chefchaouen, so our legs are hurting today but not in a bad way. The next few days we'll be in Fez.